Released on: Frontiers (Europe), TML (US / Canada). Release date: Available now! I guess Triumph are known as the ‘other’ rocking trio from Canada, often overshadowed sadly and unfairly, by the more prog rock style of a certain band named Rush, who tend to write more, less radio friendly songs in general. Triumph – Rik Emmett (Guitars/Vocals), Gil Moore (Drums/Vocals) and Mike Levine (Bass/Keyboards) – were formed in 1975 and had a style more akin to classic / melodic hard rock, but were often compared to Rush, due to Rik and Gil having a similar vocal style in octaves to that of Geddy Lee (Bassist/Keyboard/Vocalist - Rush). For me, discovering the band from my own perspective, their brand of music was much more hook laden and easier to familiarize myself with – Great sing-along material for the average rock fan! – so I personally prefer these guys. No, Gil Moore is no Neil Peart, but then Neil Peart can’t sing, Gil dos a fine job of doing both! I do believe also that Rik Emmett could give Alex Lifeson a good run for his money and Rik sings lead vocals alongside Gil Moore, so there is a difference. Mike Levine vs. Geddy Lee, well, perhaps that’s where Geddy pulls back some points for Rush … You call it folks, but before you do, remember they do take two different rock roads generally. I was excited when I heard these guys were reuniting to play two big festivals and there was also much talk of further touring too. Rocklahoma was one festival and this was the other. It’s interesting when you watch the Press Conference in Sweden, in the bonus footage that the band initially declined taking the headline position for the show and opted for an earlier in the day slot and then kicked themselves about doing that, since the band are renowned for their big stage and light show. Suffice to say, there’s times during their set where it does seem a little silly to let off flash bombs …, in daylight! I was also I suppose a little surprised by the final setlist for the show too, as ‘Hold On’ – An all-time personal favourite of mine. – which I thought was popular – Even if not a hit … - was not included in the set, perhaps a better choice than ‘Blinding Light Show / Moonchild,’ but what do I know? Maybe in Sweden it was the other way around? Anyway, enough of my opinions and gripes, on with the package’s run down! ‘When the Lights Go Down,’ opened the set here, and I just wonder if maybe ‘Allied Forces’ might not have been a better choice, but then again, maybe building to that was the right way to go. Clearly in the crowd at the front and in segments of the crowd were pleased just to have Triumph there and as time went on in the show, it was obvious that they had won more new fans! By the way, great to see Rik Emmett’s partner in crime from his solo work, Dave Dunlop cranking out riffs on second guitar as well. A good number in the set next from a fans standpoint was ‘Lay It On The Line,’ which is warmly accepted along with some great guitar interplay between Rik Emmett and Dave Dunlop, before ‘Allied Forces’ takes control! Hopefully, the actual crowd at the festival got that all too and it hasn’t simply been added to the DVD, for effect? ‘Never Surrender’ next, seems to be popular with the Swedish crowd, again reflecting good exchanges between Dunlop and Emmett but it does also seem as I mentioned previously, that the support of the band got stronger, as the set progressed. Great track that was also a minor UK Top 60 hit single at the time. Much as I know a lot of the band’s reputation has been achieved by recognition of great light and stage shows in the past, the actual track ‘Blinding Light Show / Moon Child’ that is offered up next, seems to lose the band a little momentum in the set here. It’s kind of a deep track generally, that combined with ‘Moon Child’ as it was on the band’s first album, ‘hang’s’ the track out for over ten minutes, with some self-indulgent moments obvious. This is where I think say trading this segment for say ‘Hold On’ and perhaps also, ‘World Of Fantasy,’ it would’ve come across better. Maybe it’s just me though ….? Then the band eases into their famous cover song, Joe Walsh’s ‘Rocky Mountain Way’ which brings the crowd back with them a little more, as it’s a popular tune the world over. ‘Magic Power’ next, which was a Top 10 hit single in the States - Although sadly it never created the same success for the band in Europe, which still evades me. 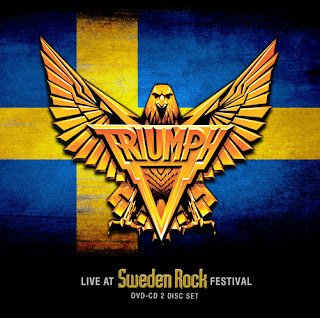 – is well received and without doubt is another of my favourite Triumph songs, goes down well. Rik does seem to struggle a little with this one, but you know it’s still a winner for me. A serious jam is had next on ‘Rock & Roll Machine’ and once more Dave Dunlop and Rik Emmett play well off each other, with Rik even allowing some limelight for Dave, who is clearly a greatly talented player. Little wonder that Rik tours with the guy! They close the package here with ‘Fight The Good Fight’ and it all seems to be over too quickly, with just a ten song set – OK, eleven if you include Moon Child! – but then it has clocked in at just over an hour. It’s a good set, yeah, would’ve, could’ve been better for me personally and maybe many other fans, if they’d switched song different songs in their set, but they obviously went with what they felt comfortable with. The bonus features include the aforementioned press conference, which is interesting, especially when they are asked about any new Triumph album or material and they come back with answer that tells the press, let’s see how this goes, as this is our first union in over twenty years … Of course, this concert took place four years ago, so I think that answers its own question, plus Rik is really the only ‘active’ musician of the trio, since Gil won’t let go of the reins for long, of his Metalworks studio and business. Mike has his own ventures too, so sadly I do think it’s doubtful that we’ll see new material or any real touring from these guys again. Enjoy this for what it is folks, a trip down memory lane.